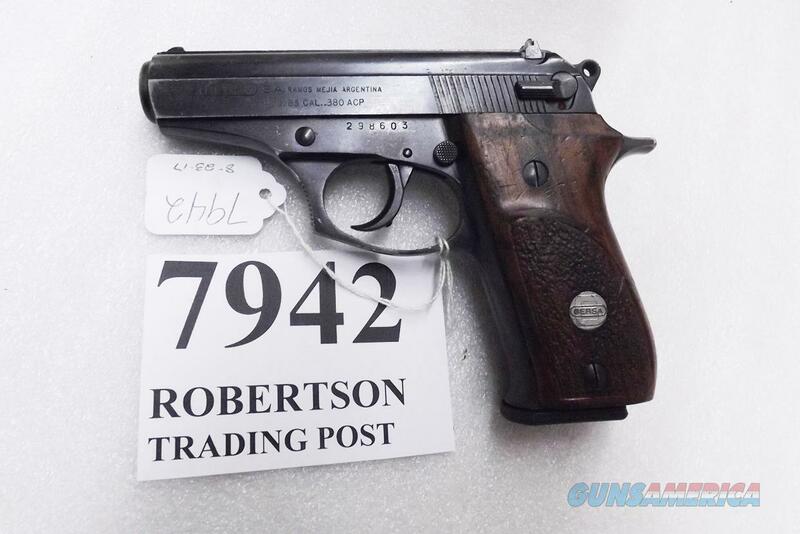 Description: We’re well into our fifth decade selling Bersa Pistols, and their quality has never disappointed our local customers. Here is Bersa’s first high capacity pistol, the model 85. Production ran from 1988 until 1994 on this variant. From this specimen’s 290000 range serial number, it was manufactured in 1993 or 1994, Late Production. Manufacturer is Bersa S.A. of Raos Mejia, Argentina. This specimen served in the Land of Israel with the Mishteret Y'Israel Israeli civilian police. It has recent US Importer's stamp on the right side of the slide. Type is hammer fired blowback semi automatic compact pistol. Construction is entirely steel metal, with stippled surface Argentine hardwood grip panels. Barrel is 3 1/2 inch with six groove 1:10 right hand twist rifling. Slide is rounded steel, with serrated rear laterals. Sights are black stake on small partridge front, lateral serration rib, and dovetailed, windage adjustable rear with steel black blade insert. Trigger is .350 serrated face with overtravel stop; and hammer is .295 Beretta type. Double action pull is smooth and consistent 12 pound vicinity, with a two stage single action 4 3/4 pound pull with moderate felt creep. Chambering is .380 ACP caliber; this 85 comes with a modified Mec-Gar 13 shot finger rest magazine, fully loaded capacity 13 + 1 rounds. 85 Magazines will Not interchange with Thunder 380 Magazines, unless the Thunders are modified. Beretta 85 mags can be modified to work. This Bersa has a firing pin block safety, a manual safety / decocker, and even a magazine safety. Its feel, its ergonomics, approaches a Beretta 85. Overall length is 6 5/8 inches from muzzle to grip frame strut; height is 4 1/2 inches; slide thickness is .865 at the ejection port; and maximum grip thickness is 1.35 inches. Weight empty is 22 ounces, with center of gravity at the magazine release. Finish is blued laterals with matte blue verticals. Surface detractions on this 85 are moderate, principally finish freckling and even some toning on the grip frame and slide. We rate it as Very Good, 75 percent vicinity by our estimate. Photos, at any rate, ought to suffice for our distinguished shoppers to judge finish grade for themselves. Bore, chamber, and mechanism are all bright and clean. We estimate this pistol has been fired fewer than 300 times. This little used pistol is attractive, eminently serviceable, and even collectable. We’re offering the Bersa 85 in the photos	for only	$ 239.00. Not transferable to civilian residents of California, the District of Colombia, or Massachusetts. Any ammunition or personnel in our photos are Not included. For civilian buyers in Connecticut, District of Colombia, Hawaii, Maryland, or New York, $20 off but no magazines. Magazines are NOT readily available for this model. Professional gunsmiths can modify a Beretta 84 magazine and make it work, only if they are willing to do so.